Prof. Jayashree Ramadas is the centre director of Homi Bhabha Centre for Science Education. She did her M.Sc from IIT Kanpur and her Ph. D. from HBCSE. Pulled into the role of teacher-educator as a graduate student, at HBCSE, she got interested in students’ ways of thinking about science concepts and also had a chance to explore this field in more detail during her post-doctoral work at Leeds and Chelsea College in UK. In the 1990s, Jayashree got a unique opportunity to develop a science curriculum for junior classes based on research and field work and unconstrained by syllabus requirements. She and her team went on to develop Small Science – a series of innovative primary science textbooks, workbooks and teacher’s books, for each grade – with the aim to engage students and teachers together in a joyful and meaningful learning experience. In this talk, delivered during the 14th WATIS Partners’ Forum in February, 2014, Jayashree describes some of the common shortcomings seen in the design of Indian school-science textbooks, her journey and experiences in developing the Small Science series and some of its key features, the challenges in implementing and scaling up innovative experiments, as well as the advantages and limitations of working within institutional settings. I am going to talk about Small Science Curriculum. It consists of a textbook, a workbook and most importantly, a teachers’ book for each class – which is why I am not calling it a textbook but a curriculum. I’ll of course get to the books, but I would like to place them in the context of the Homi Bhabha Centre and what we aim to do there, and how the Small Science curriculum fits into our overall institutional goal. And here I realize that I am perhaps one of the few participants who actually come from a formal institutional framework. I started working in science education almost 40 years ago. In fact, HSTP’s (Hoshangabad Science Teaching Program) Anil Sadgopal was also a member of TIFR, and so were Vijay Kulkarni and R G Lagoo. The origins of both HSTP and the Homi Bhabha Centre [were similar]. We are siblings, so to speak. And the way that we worked towards that aim within this institutional structure – there are basically three aspects of what we do. One is the research and innovation – coming up with good ideas, second is development of materials and methods, and third is outreach and advocacy. And these go on synergistically. At least, that is the idealization. So when we do material development, we take results from research or do research simultaneously, along with the development of materials. The research is also carried out in the context of our contact programs with students and teachers. So when students and teachers come to us, or when we go to them, our data collection and asking of research questions happens at the same time. And of course, the materials that we develop go into our outreach programs. So there is a synergistic relationship which is very important. Some of these aspects – like research, for example, are something which can be most easily done in an institutional framework and an institutional structure, because you need facilities. So that is where I think the institutional structure has an advantage. It also has a huge disadvantage in terms of the outreach aspect of it, because [though] a small institution cannot do things on a large scale, field-level interactions – genuine field-level sustained interactions – are harder in an institutional structure. As an example, we started off with HPCSC(?) and then we found that it was really getting very hard. Anyway, this is a different point altogether. These thoughts came to me after the morning session. But let me get on to what I really want to say right now. So there are these three aspects of our work. And if we want to make a change in science education or if we want to innovate – any innovation needs a knowledge base. And there are two aspects to this knowledge base. I am talking in a somewhat circumscribed sense, in the context of our own work. The two aspects are research in science education and the practice of science education. In the Homi Bhabha Centre, our research is broadly of two kinds – comparative studies of Science and Mathematics learning, and socio-cultural studies of Science and Mathematics learning. Sometimes, of course, these happen together. It is not as if they are entirely separate. And the kind of practice that we are looking at, it is not direct classroom teaching but remedial teaching. Talent nurturers are working with a spectrum of students, teacher education – in-service mostly but more recently we have also started working with DIET faculty involved in pre-service teachers’ training. In the last few years, we have had several programs for DIET faculty. [So we have] the cognitive studies and the socio-cultural studies and there are not really very sharp divisions there. (In) practice of science education, I mentioned some institutional experiences. But I also had personal experiences before and during my work with the Small Science curriculum – my own learning (and) some teaching. Not a whole lot of teaching, but a lot of interviewing of students. In the course of my research, I had to interview a lot of students to try to understand the way in which they think. And a lot of ideas came through talking to kids and trying to understand how they think. Observation of schools and lessons in a variety of settings – rural, urban: I had about 200 hours of actual observations of what goes on in a primary science classroom – what kind of interaction happens between the teachers and students, what role the textbooks play, what it is in the dynamics of the teacher-student interaction which has the potential to lead to good learning. And teacher education and classroom trials are also something which continuously happened. Throughout the process of development of this curriculum, trials in the classroom were a very essential part – trials, documenting these trials, sometimes audio or video-taping them, but often just keeping logs of what happened in the classroom, what the teacher did and what kind of responses came from the students; and preparing preliminary versions of worksheets and then doing them with kids – seeing what they find easy, difficult, changing according to that. So classroom trials were quite essential. I am going to talk about what it is that we try to do differently in the Small Science curriculum. And then this question which I think concerns us all is, when we do something different and more relevant or innovative, how does it permeate the school system? Does it make any change at all in the school system, or at any level? One thing to note here is that teaching methods – although overtly there are a lot of differences between rural and urban settings and the kind of exposure that rural and urban students have, the kind of opportunities that are there in various kinds of schools – there are some parallel that you can draw between them. Rural students go around – they are not confined to a small house or a bedroom or a study room; they are not made to sit down and study all the time. So they have rich experiences of the natural environment. But it lacks systematization. It lacks expression – clear expression. Systematizing the observations and expressing them clearly – basically, these are the two things which are needed for rural students. For the urban students, they are confined to bookish learning. And they are, in fact, systematically trained to ignore their natural surroundings. If they go outside to play, they are made to come back; if they pick up something in the playground, they are made to drop it and wash their hands clean. We would like a curriculum which is applicable to both. I think we are trying something rather ambitious, which is to have a curriculum which will apply equally to students from any kind of background. And you can question this claim, but this is what we are trying to do. Now I am fast-forwarding to something which happened quite recently. We were asked to review a draft of an EVS textbook written by an SCERT. A few of us sat for a week continuously, and critiqued every page of the book. It was an EVS textbook for Class 3. It was still in draft form. But what did we notice, broadly? That it’s a collection of mostly quite trivial facts. It’s mostly things which the students probably know already – It is stated in more formal language, but it’s nothing terribly new. It is diverse facts and so there is no focus – no focus on either situations or some theme. It lacks a self-consistency or an internal structure, or patterns and connections across [the text]. I will say a bit more about that because this is something [the appreciation of which] we just don’t see in textbooks and I think it is very important: It is an assumption of science education researchers that there is a parallel between the nature of science and the nature of students’ learning – that children actually think like scientists. And there are parallels in, for example, the basis of our learning being in observation and experimentation, in logical reasoning, in theory-building and in participation and practice. These are aspects of science as well as of children’s learning. And they are all missing in [most] textbooks. The focus, patterns and flow of text – you need to organize knowledge; you need to integrate. I find that typically, in textbooks, one part of a chapter has nothing to do with the next part. One chapter has nothing to do with the next chapter, what you learn in one class is completely disconnected from what you learn in the next class. The connections are missing. And conceptual flow is missing, as is a relation between pictures and text, and helping students learn to interpret new information in the light of old knowledge. This is all missing. One method that is recently being used – possibly this trend was started with Khushi Khushi – is of using narratives or stories. Narratives of course are used in the NCERT books quite extensively. But using narratives in a meaningful way is actually quite difficult. First of all, you need to achieve that emotional connect. Kids have to relate to it, either through their past experiences or through their concerns of various kinds. The story should appeal to kids. The structure of a narrative is in the form of a script – something happens, and then something happens after that etc. So it is an event-based thing. But particularly, I can say for Science – and I believe it is also true for Social Science – you want to build a schema. You want to build a way of thinking in the students’ minds which will help them to interpret these and other experiences which happen after it. So weaving this schema into a script – one is a pattern; the other is a linear flow – it takes a lot of thought and lot of skill. In fact, the sad thing is that even when it is achieved, it is not recognized to have been achieved. I have found that even some SCERT books have some nice narratives which have built up a nice pattern. And then in the next rewriting of the textbooks, it is lost. So even what one has achieved, if one has not recognized that this is the thing you want, it leaves little hope. Another thing with EVS is that you have to integrate the social and the natural world. So schemas which are appropriate for Science and Social Studies have to be integrated. It is hard to do. And Small Science is not an EVS book – it is a Science book – so these problems didn’t arise. But in the EVS books which we saw, these problems did exist. We found that questions were mostly closed-ended, recall of information already provided, no stimulus, no opportunity to observe, analyze, reason, justify, connect or act, and a lot of trivializing and talking down to students. So there is a belief that kids are just kids – bachchhe hain. There were very inane kinds of statements. They just occupy space. It means nothing to the child; it doesn’t achieve anything. And the book is full of such very patronizing kind of statements. The textbook, we found, was lacking in space for diverse and varied experiences – in examples, in illustrations and pictures and in the kinds of questions which are asked. The questions which are asked should elicit answers from diverse backgrounds. The question itself should not constrain, so that it taps only one kind of a background. Gender disparities, stereotypes – you know, you just turn a page and it is there – throughout the book, we found so many examples. After forty years of talking about gender disparities, you find things like: ‘Who is hungry? The boy is hungry’. He is the one who asks for food. In another chapter, in a completely unrelated story, there is a girl who is refusing food. There are members of a family where every member of a family should work. Everybody is shown working. But there is no young boy on the scene. A lot of sports persons are shown, but they are mostly male. So this was an example of an EVS textbook which we looked at to critique. And this has happened quite recently. a researcher who was doing the major part of the writing. But these roles got interchanged. Sometimes the artist would suggest things to be written, or the teacher would suggest things to be drawn. So there was a lot of continuous close interaction between these people. The teacher not only trialled in the classroom, but also trialled every activity and experiment – did it beforehand, made sure it worked, looked at what were the kinds of materials that could possibly be used. So every activity – even the most trivial of activities and experiments were tried out. This is the approach of Small Science: It begins with asking questions and trying to make sense of the natural world, and organizing these experiences. One could have similar organizing principles which work in different environments. The idea is to use the textbook as a stimulus for the child to go outside the textbook – to observe; and then to use the textbook as a framework for organization of that knowledge. The kind of world which is projected in typical Science textbooks is a very sanitized and idealized world. It exists only in the textbook. It is not the real world at all. But the Small Science series is not cleaned up. There has to be an earthiness to textbooks. It is not a ‘faraway fantastic world’. You find a lot of books these days which talk about the Amazon rain forests and things like that. But Small Science is not something very fantastic. It is something which exists around you – the world in which you live, which you engage with and experiences which are authentic. These are stages of a decaying banana peel that were drawn by Karen, who was working on this book. Or the sun, the moon and the stars – which are accessible to everyone and they are everyday experiences. And you engage with this world through observing, drawing, recording and analyzing. You do lots of things. You don’t just stop with observing. Expressing, discussing, arguing, writing and communicating with your peers – all of these things happen, for which you need certain tools. And these tools are really at the heart of the content. These tools are what we want to develop in the students – the learning tools – which are habits of observing systematically, quantitative thinking and language skills. There are several exercises for quantitative thinking – on counting, tabulating, graphing. Also for expressing, describing, developing language skills and design and engineering – planning and constructing – using your hands to construct. This is what is also assessed. The assessment system is also a part of it. It is actually a continuous and comprehensive evaluation. The assessment system is integrated into the curriculum. These are some examples of systematic observation. You plant various things. You don’t just plant a mung seed or a mustard seed which is sure to sprout. You also plant things which [do not sprout]. The teacher knows beforehand. The kids perhaps don’t know that dal will not sprout, or sabudana will not sprout. But they plant them and see which ones sprout and how they sprout and how they grow. And then they guess why others did not sprout – watching and observing systematically. Addressing students’ conceptions – this is also something which came out of our research (even though it didn’t lead to research publications per se). But every single activity was tried out in the class. And then the students’ responses made us realize that they were actually interpreting things in very unexpected ways. Addressing these – the misinterpretations which were reflected in the observations which were asked for in the textbook and workbook – helped us to make the activities more systematic. So the students’ ways of thinking impacted us. Systematic Observation also includes drawings – Firstly, seeing a value in children’s drawings. The textbook did not just have drawings made by the artist/designer but also had children’s drawings, using these drawings as tools for learning and thinking and for self-expressing – and to bring out the creative element which is also there in the child. And the observations had to be critical and had to lead to generalization. Noticing similarities and differences – This is a tool which we often used: find two similarities and two differences between any two things. A lot of examples were there. For analysis, we also used tools like the Venn diagram. These books were written between 1998 and 2004. After that came the NCF and then the NCERT books and so on. 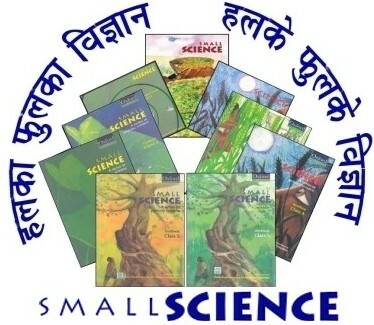 So many of the ideas in Small Science were used in SCERT books, and in NCERT books also. And this particular idea was one of them. So in the NCERT books, you will find that these three circles are separate. The overlapping is removed. So the whole idea of the Venn diagrams, of logical thinking, of classifying and of something belonging to two categories or three categories, is gone. Kids are actually able to think like that. There is no reason to assume that they cannot. But textbooks assume that they cannot. And that is the most damaging thing, I think, that has happened. Quantitative thinking has a lot of exercises of this kind – watch for numbers – look for numbers around you – count, estimate, serialize, measure, shapes and sizes, picture graphs, Venn diagrams. These kinds of diagrams were made from observation – looking at sunrise, sunset and then looking for hours of daylight and hours of night-time. Language skills – To recap, I am going through those tools for learning which I mentioned in the beginning. The first was observation and analysis. The second was quantitative thinking and I just showed you some examples of that. And the third is language skills. There are stories and poems, of which some are just for fun. But we weave some conceptual framework into them. Or sometimes it is just word play. It is overtly playful, but there is a lot of learning in it as well. There is oral and written expression. So recounting of your experiences, asking questions, critical thinking, argument, debate – there questions will encourage students to do all of that. Planning: Planning to construct something, making a design. Thinking about the design first before actually starting to make it and then actually making it and trying it out, seeing if it works or doesn’t work and then changing it accordingly. The whole process – the whole cycle – of design and engineering is embedded into the activities. Then, Values in Science education – though it is not a Social Science textbook, certain values were integrated into it, like sensitivity to social issues, which was conveyed implicitly – not in a moralistic way. Caring for living things, conserving resources, community living, equity, working with hands, literary and aesthetic sensibilities. Science is not separate from these. Aesthetics has also been an aspect of Science – feelings and emotions most importantly. So Science has not been something [represented as] heartless and rigid [in these textbooks], but a part of the whole of one’s own living. For Classes 3-5, there is a textbook and a workbook; also a teachers’ book which I will come to later. They are in English, Hindi, Marathi, and some of them in Urdu. The textbook interweaves a story about two children who learn by doing and asking questions. The workbook provides a format for recording observations. And it is used for continuous evaluation. So what the child does in the workbook – and some other observations connected with that – is used for evaluating the child. There is no separate test at the end of that. And it also provides a feedback to the students. The parents, if they see the workbook, would know what the child is doing. There are teachers’ books for classes 1-5. And the teachers’ books are based on the trial-outs that we did in the classrooms. We wrote up episodes which tell a teacher that this is what can happen in the classroom when you use these books. These are the kinds of responses. For exercises, we also gave samples of students’ responses in the teachers’ book, giving an idea that often there are no right and wrong responses. There is just a variety of responses which brings out various aspects of any situation. Typically, every part may have been tried in two or three classes. The teachers’ book is thus a summary of the collective teaching experience of the field trials that we did. And it helps the teacher to anticipate the students’ responses, keep them engaged and handle classroom discussions. It also invites teachers to add their own experiences. Now of course, having done all this, it has to work in the classroom. For that, it has to be used in the classroom, first of all; and of course, that is where the problem comes, as you might imagine. But when it is used, what is the result? This is a teacher who used the books for one year. He was a part of Teach for India and he worked in a Pune municipal school. He collected money to give a set of books to each child. And he had very good experiences. You can also see his experiences in detail on the Small Science website. These are some student comments. The first books came out in 1998 and some schools started using them right from then. And this was one student in whose school it was used in the very early years. Now she is in college and she still recalls the books. In fact, she has preserved the books. They are with her still, because she loved them so much as a child. These are some things that she says about it. Of course it works with teachers who are primed, who are motivated. It gives them a way of doing something [new] in the classroom. But we have also done some studies of how it gets used in a classroom in an average school with average teachers. These teachers just get the books in their hands and are asked to use them. There is no teacher education and no orientation involved. These reports are there on the internet; you can look at them for details. But basically they show that even a differently designed book can be used in a very routine and traditional way and that teachers can completely misinterpret the purpose behind the new books. So it is very clear that you cannot just let the books out and expect that great things will happen. I am sure all of us know very well that teacher education is of utmost importance. Now, like I said in the beginning, our aim is to make a difference – to make a change. And we would like the books to be used. We would like the ideas in them to penetrate into the system. So how do we do it? Is there a space for innovative curricula in schools? I am afraid that the previous sessions have given a resounding ‘no’ to this. Like Arvind said, the space is actually reducing. But let us just say there are 50 per cent schools which are government schools or local body schools. The numbers of students in them are of course decreasing. In recent years, there has been a big flow into the private schools. We would really like to have the books used in government and local body schools. But what has happened over the years – and it is not a very happy chronology – there was initially a request from some schools to the government, the Maharashtra government in this case, for permission to use these books. And the Maharashtra government – the Secretary of Education – was quite positive. He took up a review and a Review Committee was appointed with the directors of the SCERT and Bal Bharti and SISE. They also considered whether it could be used in DPEP which was going on at the time. There was also an offer from UNICEF that they could subsidise the books – that if government schools were using them, UNICEF could offer a subsidy for printing and distributing them. But after the whole review, one White Paper in Education was cited; and the committee finally said that these books are fine, but there is this White Paper which says that only one set of books should be used all over the state. Then in 2002-3, the Science textbooks of Ladakh – SECMOL – they used parts of these books. And the Delhi SCERT considered adopting them, but then finally used parts of them. The Andhra SCERT had said that they would use parts of it as well – I am not sure what happened with that. Overall, the books have been selling about a thousand copies per book every year. So somebody must be using them hopefully. And across a broad range of schools – not exactly government schools, but schools with students from government schools’ kind of profile, and also in some elite schools. One problem which we have grappled with – without much success – is how to publish and how to make it accessible to all. The books are downloadable freely from the internet. So anybody can go and download all the books. But then the question comes – who will print? Private publishers are not ready to print something that is free, certainly not under the Creative Commons License where you explicitly say that people can use parts of it. In fact, people do use parts of it. But if you actually say it in the license, it puts off private publishers altogether. And Creative Commons has never been used for school textbooks. And if nobody prints and distributes on a large scale, then how do primary school students and teachers get access to it? They are not going to go and download from the internet. So how do they get access to it? There is a dilemma; because if you publish privately and give exclusive rights to a private publisher, then the governments are deterred from taking it up. So there is no solution. Personally, I think that it is a worthy cause for a public-private partnership. But this is something which I would like – I am sure that all of you have thought about these issues and I would really like to have advice from people about this. In 2005, Krishna Kumar was there and he put it to an NCERT committee that along with the NCERT books, these textbooks could be published and distributed. And there was a Textbook Policy Committee which said that alternative textbooks are possible. Of course, NCF, as Anjali showed, has made that possible. But they felt that it would be a logistical load on NCERT to distribute the regular NCERT books plus another set of books. Also, they found it a little awkward to say that these were just Science books. The new policy is to integrate Science and Social Studies into EVS. So how can you have two books? So they suggested that you could redo the entire series integrating Science with Social Studies. It actually took us three years to bring out each set of Science books with only three people working on them. So it was not possible to do the integration – it would have taken many more years. And we didn’t do that finally. All of these committees which sat and gave their verdict – I am really not sure what is going on – what is said and what is meant. Is there a disparity? Are they different? I don’t know; because there is too much of a pattern in this whole thing. Between 2007 and 2012, we finally gave up and asked Oxford University Press to publish these books. But we found that they had their own competing textbooks. So they promoted these (Small Science series) in schools which they felt were more away-from-the-mainstream. And in the other, normal schools, they promoted their regular books. In fact, Oxford did not sell any more copies than we were selling just sitting at HPCSC and responding to people who sent requests. We would put the books in a box and send them. The numbers weren’t very much better with Oxford. From 2012 onwards, we tried this public-private sort of a thing. There is this InOpen Technologies – a company located at SINE (Society for Innovation and Entrepreneurship) which has start-ups that are seeded by the IIT; and which has been started by some faculty members of IIT Bombay. I am not very sure how this arrangement is going on because the kind of interaction which I had hoped for – the kind of feedback about which schools were using the book – we never managed to get. The publishers print and distribute and we never know which schools are using it. That makes the teacher interaction very hard. We have a mailing list. I am sure that some of you are also on that mailing list. But nothing much happens on the mailing list because people don’t write on it. So, building this community of teachers who communicate with each other, share their experiences and gain from each other’s experiences – that has not happened, which I think is the most important thing to happen. In the National Curriculum Framework (NCF) 2005, a lot of the ideas I have talked about regarding the design of the books came in explicitly, particularly because we were part of the National Science Teaching focus group. Homi Bhabha Centre and Eklavya had quite a lot of influence on the writing of the Science focus group report. And through that, the ideas were incorporated. You will notice that it is not the education establishment which came up with the ideas for the National Curriculum Framework – it came from outside of the system. These are some examples from the Science Focus Group report. Like I said, teacher support is most important. All of us who were working on the Series though, got involved in other things. And we have really not been working on Small Science after the books were written. So this continuity and having a regular teacher support, that has been missing. We had been hoping to use Integrated Media – social media and so on. But I guess most of us – at least I – belong to the previous generation. I am not into social networking. And it is really a younger generation which has to take it up, I think. And parental acceptance – that is a problem we had in the schools. We received feedback from the teachers that parents are objecting to it. They say, ‘What are the kids learning?’ One of the common questions was, ‘What will they do in the tuition class? What will the tuition teacher do?’ Otherwise the tuition teacher tells them the answer to the question – but here that is not possible. Or, ‘There are no guides’ – That was the objection raised by parents. But we also found that in some schools, teachers of one batch of students actually convince parents of another batch of students – and the older students talk to the parents of younger students and tell them that no, the books actually make a difference. And that the kids don’t lose from it – they actually gain. InOpen had this idea of integrating Arvind Gupta’s toys with Eklavya kits and with Small Science. I don’t know if you know about it. This was something that Gunvant Jain was trying; but then he left the company and that idea didn’t go any further. These are some pictures of schools which are using Small Science. Sushma is here. Your school used Small Science. Do you still use it? SS: Mostly for teachers as reference material. Our children found it difficult to buy these books. However, teachers use them as reference books. For two years, we asked our parents to purchase these. JR: Was it the cost or…? SS: Yeah. It was basically the cost. Now we have got a number of sets [of textbooks, for reference]. But workbooks we have to buy every year. However, we have sort of made these activities a part of our regular classroom work – most of these activities, which were suitable to our context. And I think it worked wonderfully. Yes. JR: Lots of people have contributed in writing, in the research assistance, in design and illustrations. Each set of books had a different designer and illustrator. There was one Poornima Burte who did the first basic design of the Class 3 book, and then Karen Haydock and Madhugandha Damle did the next few books. On translations – several people did the translations. It was especially the translating of the teachers’ books which was quite a big job. This is something which, in an institutional framework, we could devote so much resource to – in terms of time of people and in terms of varied kinds of talents that we could draw on. This is one of the strengths of an institutional framework.